Mt. 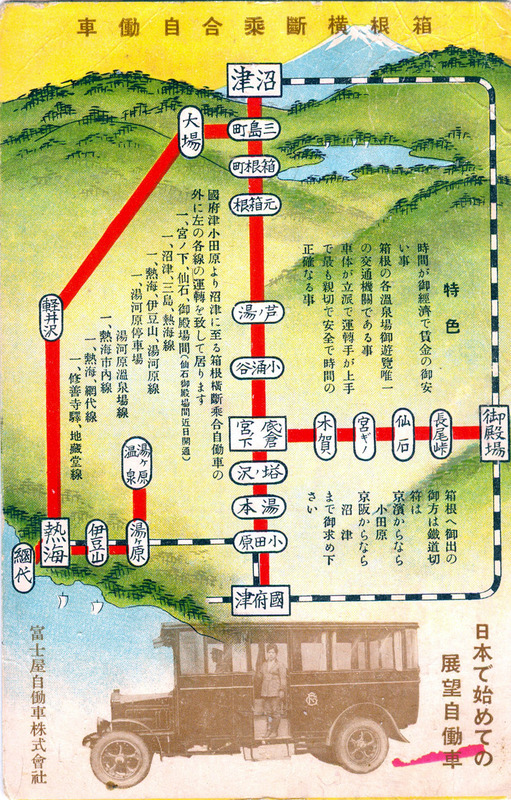 Fuji and Lake Hakone Railway Access and Bus Routes, c. 1930. Tagged with: Buses, Hakone, Lake Hakone, Miyanoshita spa, Mt. Fuji, Tourism, Tourists, Tozan Bus Co.
“On our way to Lake Yamanaka from Gotemba the last clouds of the morning withdrew their veil and revealed Mt. Fuji to us for the first time. “After following a winding, ascending road around the hills to the summit of Kagosaka Toge, our bus stopped by a platform built on the roadside at the peak of this mountain pass, from where we had a vast, uninterrupted view of the surrounding countryside. Mt. Fuji and Lake Hakone railway access and bus routes, c. 1930. Inset image is of a Tozan Bus Co. bus (and conductor) that operated along the mountain roads. 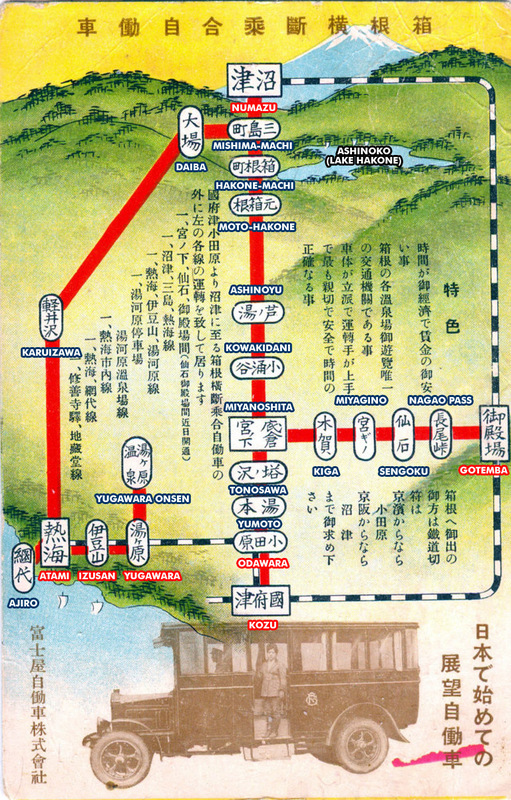 Same map as on left, but with place names added in Romaji. Railroad stations labeled in red; bus stops labeled in blue. See descriptions below. “Hakone is a popular resort all year round for both foreigners and Japanese on account of its many hot-spring resorts, beautiful scenery, and salubrious climate. Its easy accessibility from the capital and a web of good motor roads in the district add to its popularity. “Routes to Hakone: Hakone is best reached from Tokyo or Yokohama by train on the Tokaido Line to Odawara, and Yumoto via Odawara. From Odawara buses are available via Yumoto to Miyanoshita, the center of the Hakone district, whence bus lines extend as far as Lake Ashi (Ashinoko), popularly known as Lake Hakone among foreigners, and to other important tourist points all over the district. “Tourists may also go by bus to Moto-Hakone and Hakone-machi on the road shores of Lake Ashi via Odawara and Miyanoshita. There are electric trains (Hakone Tozan Railway) running along the deep intervening gorge from Odawara to the Hakone resorts, including Yumoto, Tonosawa, Miyanoshita, Kowakidani and Gora, which is the starting point of the cable line to Sounzan. “From Gotemba, a starting point for climbing Mt. Fuji on the Gotemba Line, a bus runs to the Hakone district via the Nagao Pass. The Hakone district can also be conveniently reached by bus from Atami at the east neck of the Izu Peninsula via the Jikkuku Pass or the Yugawara Pass, and also from Numazu at the west neck of the Izu Peninsula via Mishima. 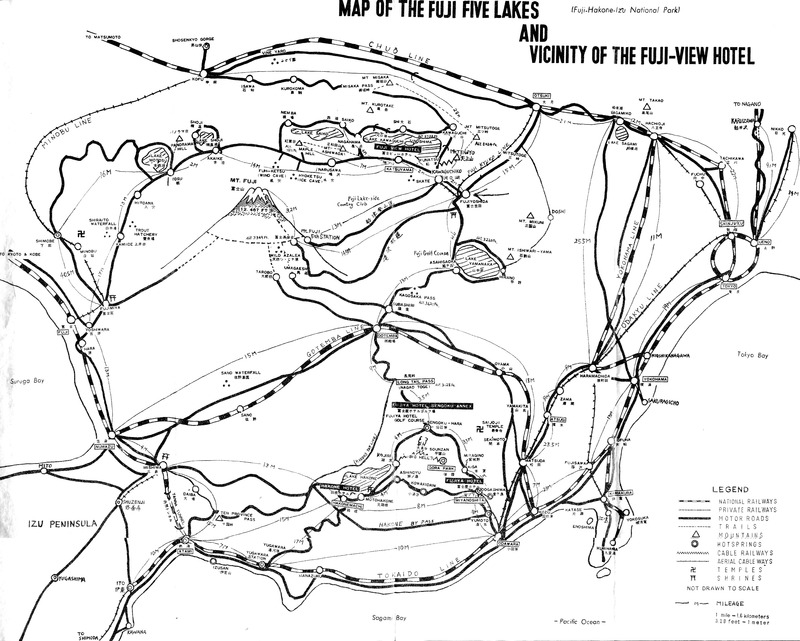 Map: Mt. 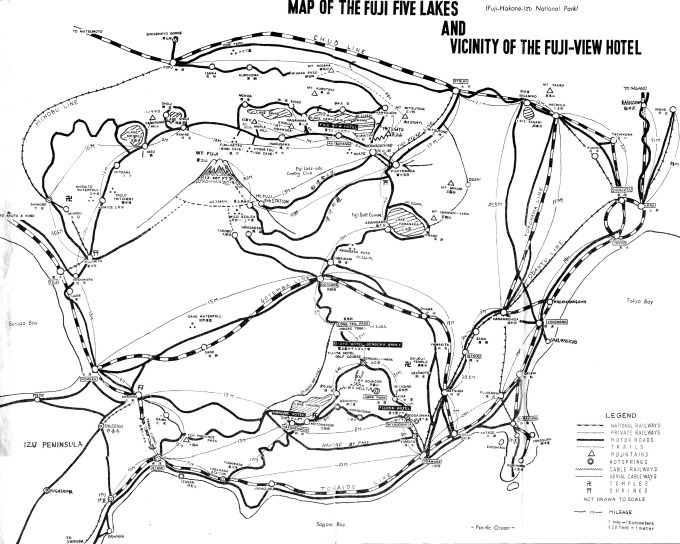 Fuji and Hakone/Five-Lakes, c. 1950, showing railway access to the popular vacation district from Tokyo (far right), Osaka/Kobe, and other cities. “From Gotemba a bus runs to Asahigaoka on Lake Yamanaka or to Funatsu on Lake Kawaguchi and to other places in the district. “Visitors from W. Japan can transfer at Numazu on the Tokaido Line for Gotemba, or transfer to the Minobu Line at Fuji on the Tokaido Line for Fujinomiya, and to Fujinomiya. From Fujinomiya there is a regular bus service to Motosu on Lake Motosu, and to other desired points at Fuji’s base.